This page explains Motive installation and activation process using software license information provided with your purchase. 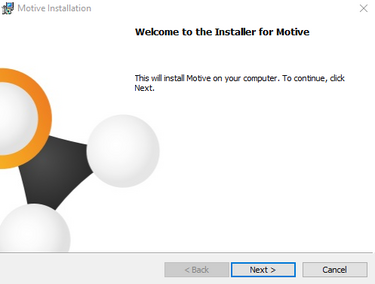 To install Motive, you must first download the Motive installer from our website. Follow the Downloads link under the Support page (http://optitrack.com/downloads/), and you will be able to find the newest version of Motive or the previous releases if needed. Both Motive: Body and Motive: Tracker shares same software installer. 1. Run the Installer. When the download is complete, run the installer to initiate the installation process. 2. Install the USB Driver. 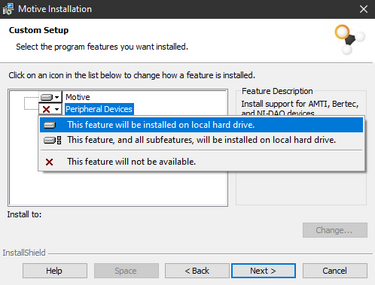 If you are installing Motive for the first time, it will prompt to install the OptiTrack USB Driver (e.g. OptiTrack_USB_Driver_x64). Install this driver. This driver is required for all OptiTrack USB devices including the hardware key. After the driver has been installed, continue onto installing Motive. 3. Install Motive. Follow the installation prompts and install Motive in your desired file directory. We recommend installing the software in the default directory, C:\Program File\OptiTrack\Motive. 4. OptiTrack Peripheral Module. At the Custom Setup section of the installation process, you will be asked to choose whether to install the Peripheral Devices along with Motive. If you plan to use force plates (AMTI and Bertec) or NI-DAQ devices along with motion capture systems, make sure the Peripheral Device is installed. If you are not going to be using these devices, you may skip to the next step. The Peripheral Devices, also called OptiTrack Peripheral Module, consists of the necessary plugins for integrating force plates (AMTI and Bertec) and NI-DAQ devices. If you decided to install the Peripheral Device, you will be prompted to install OptiTrack Peripherals Module along with NI-DAQmx driver at the end of Motive installation. Press Yes to install the plugins and the NI-DAQmx driver. This may take a few minutes to install. Note If any of the required version of redistributables (.NET framework, Direct X, VC runtime) are missing from the machine, the installer will ask to install them along with Motive. Make sure to install these packages as well. Once you have installed Motive, next step is to activate the software using the provided license information and a USB Hardware Key. There are three different types of Motive licenses: Motive: Body, Motive: Tracker, and Motive: Edit. Depending on the type of license you are activating with, different tracking features will be available within Motive. Motive: Body is a comprehensive license which provides all of the tracking features; including both rigid body tracking and skeleton tracking. Motive: Tracker is capable of tracking rigid bodies. Motive: Edit only features post-capture editing tools for processing captured tracking data. 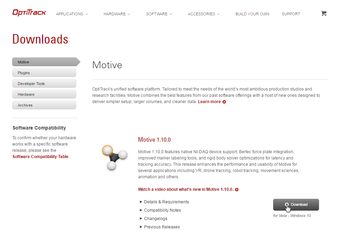 For more information on different types of Motive licenses, check the software comparison table on our website. Motive splash screen: License activation. Step 1. Launch Motive. First, launch Motive. Step 2. Activate. The Motive splash screen will pop up and it will indicate that the license is not found. Click and open the license tool and fill out the following fields using provided license information. You will need the License Serial Number and License Hash from your order invoice and the Hardware Key Serial Number indicated on the USB hardware key. Once you have entered all the information, click Activate. If you have already activated the license before on another machine, make sure the same name is entered when activating. Step 3. License File If Motive is activated properly, a license file will be placed in the license folder. This folder can be accessed from the splash screen or by navigating to Start Menu → All Programs → OptiTrack → Motive → OptiTrack License Folder. Step 4. Hardware Key Insert the corresponding USB Hardware Key to use Motive. Step 6. Re-launch Press Retry or re-launch Motive. Now the Motive license has been activated and you will be able to use Motive. Note: Purchasing a license is not required when using a V120:Duo/Trio tracking bars, as the device itself acts as a USB Hardware Key and also includes a built-in perpetual Motive: Tracker license. When a Tracking Bar is connected to a PC, Motive will run without asking for license activation. The Motive License can also be activated from online using the Online License Activation tool. When you use the online License Activation Tool, you will receive the license file via email. In this case, you will have to place the file in the license folder. Once the license file is placed, insert the corresponding USB Hardware Key to use Motive. The software license will be valid up to 1-year from the initial activation date, and you will be able to run any version of Motive that was released before the expiration date. When the license expires, you will no longer have access to the newer versions, but you can still use the older versions of Motive that were released up to the expiration date. When your license expires, you can purchase License Maintenances, which will extend the license’s valid duration at a lower cost. To check the status of your license, use Check My License tool on our website to monitor the license status. You will need a License Hash Code and a corresponding Device Serial Number (e.g. Hardware Key) to check the license status. OptiTrack software can be used on a new computer by reactivating the license, using the same license information. When reactivating, make sure to enter the same name information as before. After the license has been reactivated, the corresponding USB Hardware Key needs to be inserted into the PC in order to verify and run the software. Another method of using the license is by copying the license file from the old computer to the new computer. The license file can be found in the OptiTrack License folder which can be accessed through Start Menu -> All programs -> OptiTrack -> Motive -> OptiTrack License Folder. This page was last modified on 20 July 2016, at 13:37.